For the final country represented on the Olympic Refugee Team – Ethiopia – we decided to dig a little deeper into the county’s cuisine. Now we adore Ethiopian food, but we were wondering about traditional Ethiopian desserts (since we have never encountered any!). Turns out, we weren’t missing a hidden dessert culture – the whole concept of dessert is pretty much an imported one. However, with the influx of sugar into Ethiopia in the 20th century, desserts started cropping up. One of the most popular desserts now in Ethiopian is the pasti, a sweet, fried dough dessert influenced by Italian food, sold in small shops called Pasti Bet (pasti houses). Here is a simple video recipe for pasti from How to Cook Ethiopian, with the video in Amharic and English text below. Pasti is even popular enough to have an Ethiopian R&B song about it! This is the first time that South Sudan (which only became an independent country in 2011) is competing in any Olympics, and 5 refugees associated with South Sudan are also competing for the Refugee Olympic team. South Sudanese shares many features with the traditional cuisine of Sudan, which features a wide array of stews, corn-based breads, and hearty veggies like okra, but relies more heavily on fish. However, the South Sudanese can do sweets, too. One of the emblematic desserts of South Sudan is a sweet semolina pudding, Kuindiong. This pudding reminds us of Middle Eastern semolina puddings, like Basboosa, and uses the same semolina flour used in Italian pasta. This recipe from SBS Australia (seen below) seems simple and delicious. For the first time in the history of the Olympics, a team composed of refugees is competing under their own banner. The 10 athletes representing the Refugee Olympic Team hail from South Sudan, Syria, Ethiopia, and the Democratic Republic of Congo, all countries affected by ongoing conflicts. Competing in swimming, judo and track and field, the athlete’s appearance at the game is raising awareness for their home countries’ struggles, and they received a standing ovation during the parade of nations during the opening ceremonies. This week and next we will be featuring foods and cuisines of the countries represented by this brave team. Though we have written about the food of Ethiopia, Syria and the DRC, the food of South Sudan is new to us. We look forward to seeing more of these athletes! Kosovo, which gained independence only in 2008, competed in the Olympics for the first time in Rio, and in their first showing, Majlinda Kelmendi won a gold medal in Judo. In honor of this win, we thought we would delve a little more into the world of Kosovar cuisine. Though it is similar in many ways to its Balkan neighbors in Albania, Serbia and Macedonia, Kosovar cuisine has some unique dishes that set it apart. One of the most iconic is Flija (or Flia), a round layered dough cake/bread, which incorporates yogurt into the batter. Global Table Adventure has a recipe for Flija (pictured below), which leads you through the steps of adding layer after layer to the dish. Though Global Table Adventure has adapted the recipe for the typical kitchen, Flija is traditionally baked outside in a large silver pan known as a “saç.” Flija seems seems complicated, but looks delicious! A Tour of Hidden Russian and Georgian Devon Ave.
Chicagoans associate Devon Avenue almost singularly with a vibrant Indian community, and vibrant Indian food. But travel a bit further west on Devon, and it morphs into a Russian community, home to some of the city’s best stores for Russian and eastern European fare. We set out with one of our good friends, a Russian-born New Yorker from Brighton Beach no less, to see just what Devon had to offer. We figured it was perfect timing to inspire you to get some Russian goodies in honor of the winter Olympics in Sochi! Our first stop on Devon was Argo Georgian Bakery (2812 W. Devon Ave.), a place we had been meaning to try for quite a while. Right in the center of the store was an amazing Georgian oven. There were an assortment of delicious baked goods for sale, and we especially enjoyed the Hachapuri (Georgian bread stuffed with cheese). You can also get a variety of breads (lavash and shoti), and bean-filled breads (lobianai) and also frozen foods to bring home. We are carb lovers, and absolutely adored the freshness and artistry of these breads. We were not lucky enough to see bread being removed from the huge beehive-shaped oven, the toné. But we have learned how the bread is made: it operates similar to a tandoori oven, where the bread is stuck to the side walls as it cooks. After filling up on bread at Argo, we headed over to Three Sisters Delicatessen (2854 W. Devon Ave.). Three Sisters is a nice, but small, specialty store absolutely jam-packed with treats from Russia. One one side there is a large meat case, and a selection of some pretty appealing looking cakes. You are also in luck if you are in the market for caviar, salted fish, or Russian cookies and chocolates. At first sight the blandly-named City Fresh Market (3201 W. Devon Ave.) looked like a typical neighborhood grocery store. But once we got inside, our friend got so excited: the market has a strong Eastern European flavor, with a huge array of Eastern European canned goods and deli items. Her personal favorite, and ours, was the huge pickle bar, packed with unusual things like pickled tomatoes (as seen below). This was a real standout, and unlike anything else we had seen in Chicago! The first in our Winter Olympics newcomer series is Tonga. The sole athlete from Tonga is certainly making waves at their first Winter Olympics, the luger, born Fuahea Semi , now Bruno Banani, did not place, but by changing his name he won an endorsement deal from a German underwear manufacturer with the same name. Antics aside, we have always wanted to try Tongan cuisine, since the South Pacific has so far eluded us in culinary terms. Being an island nation, fish plays a large part in the island’s cuisine, along with other staples like coconut, sweet potato and cassava. 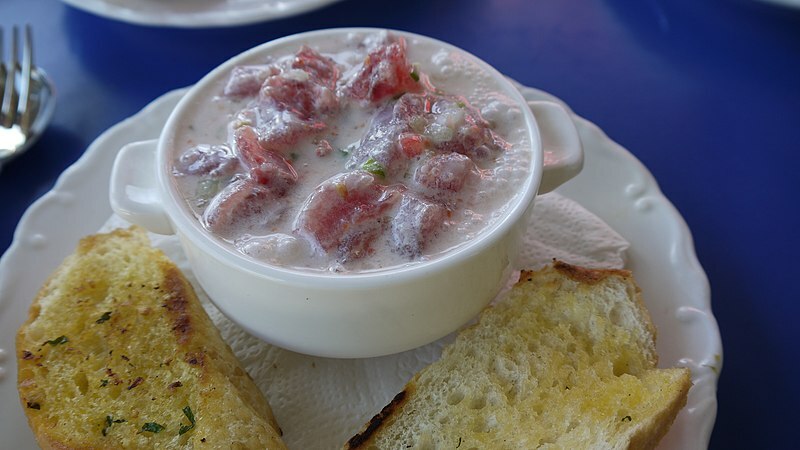 One of the most iconic dishes in Tonga is ‘Ota ‘ika, known sometimes as “Tongan ceviche,” fish marinated in citrus and coconut milk, similar in some ways to Latin American ceviches. Since M loves ceviche, I can only assume we will be making this recipe soon. Check out recipes from Daily Dish and Radio NZ to get a good start. Are there any other Tongan recipes you would recommend? What did you think of the Opening Ceremony? With the 2014 Sochi Winter Olympics officially under way, we are in full Russian food mode. We are not experts in Russian food, but we have trying to learn more about the country’s different regional and local specialties. We’ve done a little research in preparation for a Russian dinner party in honor of the Sochi Olympics, to get a little beyond Borscht (Beet soup) and vodka (though of course, those are great, too). Here are some recipes to get your Russian dinner party started. Do you have any favorites you would recommend? The 2014 Winter Olympics in Sochi, Russia start February 6th, which means even more inspiration for exploring international cuisines. The setting in Sochi, a resort town on the Black Sea, also provides a great springboard for learning more about Russian cuisine. Sochi, in particular, is known for its idiosyncratic cuisine that is a result of the cultural interchange along trade routes. The Russia and India report has a list of unique Sochi-specific dishes to try.